At Blue House Farm we raise chickens and ducks as naturally as possible. Our flocks live on pasture, protected at night in secure coops. The eggs our chickens produce are delicious full of flavor and with dark yellow yolks. 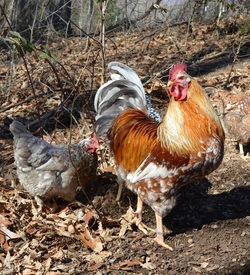 Our pullets and laying hens are strong and healthy, many of them hen raised on pasture from day one. Farm visits are by appointment only. Please see our "Pricing / Availability" page or contact us for current availability.